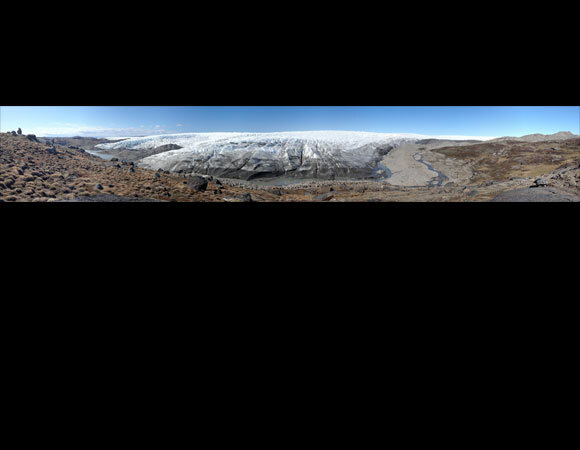 What role does water play in the movement of the vast Greenland Ice Sheet? This integrated measurement and modeling project is a comprehensive investigation of this very question. Conditions at the base of the glacier will be directly measured in six boreholes drilled to the bed, with two holes at each of three sites. Surface melt and spatial gradients in ice velocity will be quantified to enable detailed comparison between melt water forcing, basal hydrologic conditions, and ice flow dynamics. 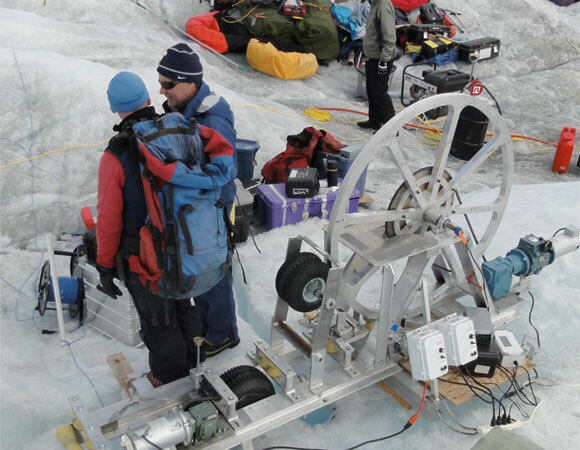 Instrumentation at the surface of the ice and at the bed will collect data at high time-resolution for up to 2 years. UNAVCO is providing three geodetic GPS receiver systems, rugged weatherproof enclosures, and power systems for continuous measurement of ice velocity near boreholes. UNAVCO is also providing ground based scanning LiDAR equipment and support in order to characterize 10 cm -10 m length scale topography near the margin of the ice sheet. This topographic information will be used to model water flow under the ice sheet across similar topography. Figure 1. 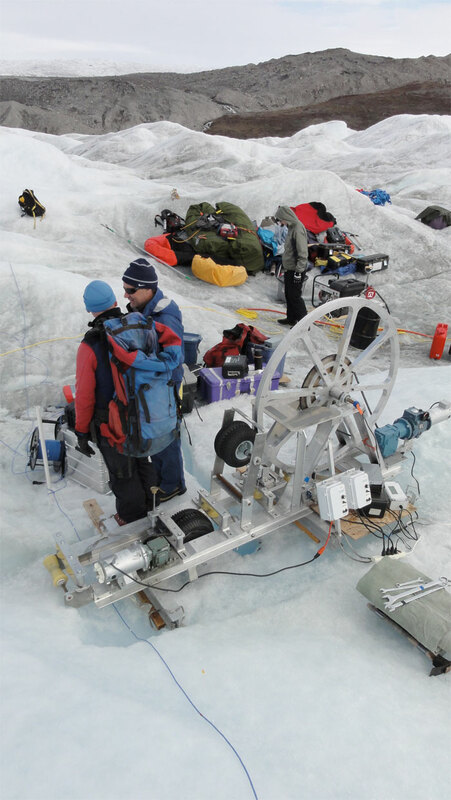 TLS set-up on Greenland ice cap margin. Photo by B. Hodge. Figure 3. 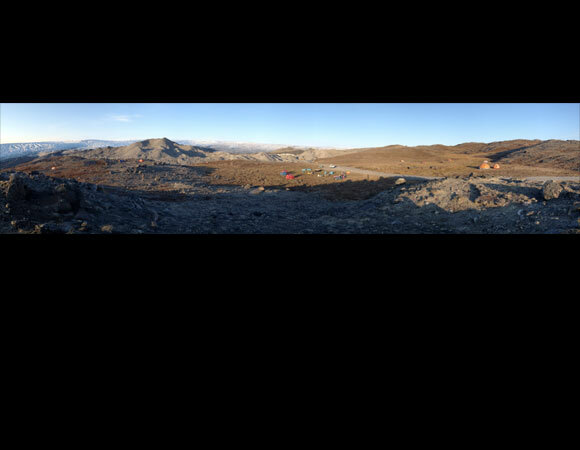 Field camp on edge of Greenland Ice Cap near TLS study area and drill site. Photo by B. Hodge. Figure 4. TLS study site on ice margin. Photo by B. Hodge. Data from the TLS survey will be used to quantify and calibrate the hydrologic response of the sub-glacial water system that occurs between the bedrock and the ice cap. Portions of exposed bedrock outcrop adjacent to the ice cap were scanned at high-resolution (<cm) to provide accurate texture characterization of type bedrock topography. The model results will help aid understanding of the hydrology at the base of large continental ice sheets. The TLS data is also used to accurately survey the locations of existing bedrock bore-hole and on ice bore-hole locations near the ice cap margin. The existing bore-holes are used to collect in-situ observations of the hydrology at the base of the ice sheet and near the bedrock interface. 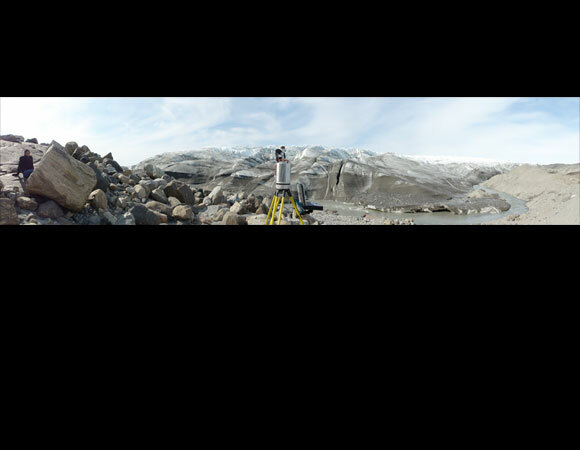 This research is contributing to the Greenland Analogue Project (GAP), which is part of an ongoing international research effort to better understand the impact of glaciation on geologic storage of radiotoxic materials.